Trolling motors are a unique and useful piece of equipment for small watercraft such as kayaks and personal pontoon boats where they can serve as the main source of power, and they open up a lot more areas for exploration and fishing opportunities with a kayak. When choosing the best kayak trolling motor given your needs, there are a lot of specifications you should be looking for and in this article, we are going to take a detailed look at these specs and also look at five trolling motors we think are highly compatible for use on a kayak. When looking at the needed thrust for a kayak trolling motor, we're not looking at much-needed thrust. There are several reasons for not wanting a lot of thrust on your kayak. The most pressing issue is that trolling motors with higher thrust metrics also require a lot more voltage to be run at extended run times. This means more or larger batteries which means a lot more room is needed that a kayak will not provide. For a kayak on lakes or inland saltwater use, we are looking at 30 to 46lbs of thrust. If you are taking on swift currents or choppy water a 55lb thrust motor might be warranted but remember that you are often limited to a 12V battery. For any trolling motor, you want to think about the shaft length that you will need. For a trolling motor kayak, often used to navigate shallower waters, you don’t need a 50 in shaft length. You're going to be dragging the bottom a lot of the time or you’re going to have to raise the shaft to a level where it is difficult to control the trolling motor head. For a kayak, you are almost never going to need a shaft greater than 30 inches and most people would like to see a shorter shaft. For quite awhile, 30 inches was the shortest shaft you could find, but you will see in this article that there are now shorter options available that are much more compatible with kayaks and other small personal watercraft. For the purposes of this category comparison, we've concentrated on shaft lengths 36 inches and under. For most kayaks, you are going to have to do some additional rigging to get your trolling motor set up properly. For some kayaks, and for other types of personal watercraft, a transom mount is going to go right onto the boat with no issues. Even with additional rigging, the mounting bracket used for transom mounts is going to be the easiest to get set up on your kayak. Bow mounts just are not going to be compatible unless you have a Masters in mechanical engineering, and, in most cases, are willing to puncture the kayak hull. If you don’t want to have to break out the paddles, you should put some thought into how much power each trolling motor pulls. Now obviously this has as much to do with the battery, if not more, than the trolling motor itself. Still, keep an eye out on what voltage the trolling motor needs to run. There are two numbers you need to get an estimate of run time; the amperage hour rating of the battery and the motor amperage draw. To estimate run time divide the battery’s amp/hour by the motors amp draw. Most manufacturers will list the motors max amp per draw at the highest speed setting so the number you get is usually the minimum amount of run time you will get. Kayaks and other small vessels are not just meant for freshwater streams or lakes. There are plenty of saltwater inlets where a kayak shines. If you do have saltwater environments in your future, you should be sure that your trolling motor is designed and built to handle the corrosive nature of saltwater. Materials: For corrosion resistance, composite materials work well in the salt, especially a composite fiberglass material. Stainless steel is also a popular material for saltwater use and it is always nice to see an anodizing process is used to further add to the corrosion resistance. 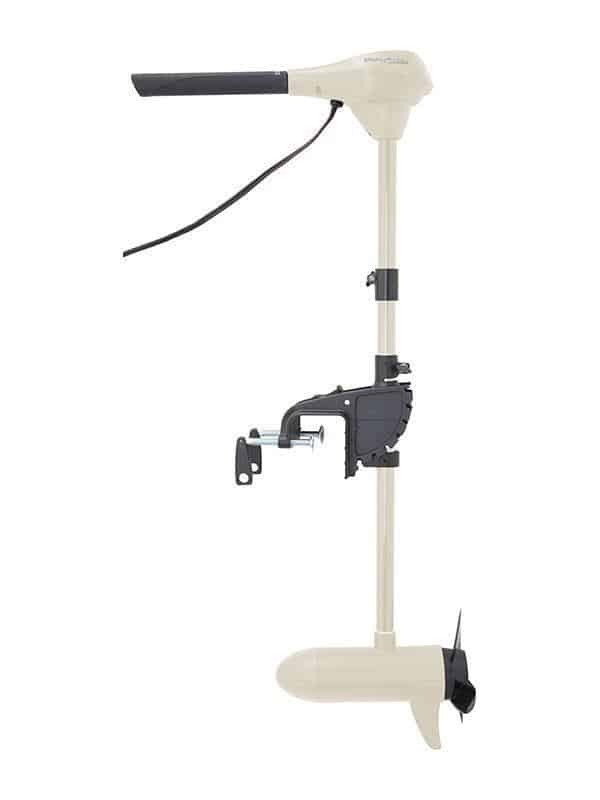 Seals: It’s near impossible to keep all the inner workings of your trolling motor unexposed to saltwater but saltwater trolling motors should have marine grade plastic that houses electronic parts. Anodes: The top saltwater trolling motors are going to use a “sacrificial anode” that protects important metal components within your motor from galvanic corrosion. The Endura C2 is a transom mount motor. This motor comes in a wide array of thrust options, all of them requiring 12V for normal run time. These models include a 30lb thrust (30-inch shaft), 40lb thrust (36-inch shaft), 45lb thrust (36inch shaft), 50lb thrust (36 or 42-inch shaft), and a 55lb thrust model (36 or 42" shaft). All of these trolling motors can also run on a 12V deep cycle battery, but using that voltage on the higher thrust options is going to mean that you have less run time. It’s all up to you but from our experience with kayaks, a 30lb thrust trolling motor gets the job done. We also like the lever lock bracket that mounts in 10 different positions. It is easy to lock into place and release and is made from a composite material that resists flexing well. Mounting on a kayak or other small vessel can be frustrating at times and the flexibility of the mount is well received. This trolling motor might look a bit flimsy as it is mostly composite material but it is a heavy and sturdy trolling motor. Overall, we give the Minn Kota Endura C2 an A rating. Sure, it doesn’t have a lot of the bells and whistles of other trolling motors, but it’s size, reliability, and durability make it one of the best options for those looking for a kayak trolling motor. The only reason this trolling motor does not get a perfect score is that you are limited to freshwater. This transom mount motor is perfect for small watercraft under ten feet in length and only requires a single 12-volt deep cycling battery. The NV series has proven to be reliable motors and with a battery discharging 50 amps per hour, this particular model can run continuously on its highest speed for several hours when paired with a quality deep cycling battery. And the head control does have a built-in battery indicator (5-point LED) so you can keep a close eye on battery life. 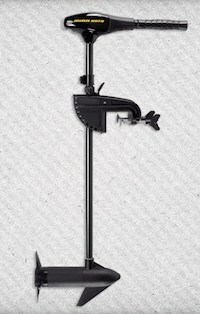 Like most transom mounts, this model uses a hand tiller that can be adjusted lengthwise up to six inches but the angle coming from the control head does not adjust. You should also keep in mind that the motor head is in a fixed position, so you need a boat with a true transom to have a proper setup with this motor unless you want to do some intense rigging out in the garage. There is nothing to complain about with the control of the motor. It is sensitive to direction changes as well as adjustments to the speed. This model has eight-speed settings with five forward and three reverse settings that can be easily managed through the hand tiller. You will also find that this is an extremely quiet motor. The nylon mount used on this motor is extremely durable and it holds tight even when bumping some underwater vegetation. Even with a 30” fiberglass composite shaft, which is height adjustable, you should still avoid too many of those underwater collisions. One of the best qualities of the NV series from Newport is that the trolling motor is also compatible with saltwater use. It should still be cleaned regularly but it does have added protection for its electronics as well as steps to help ward off corrosion of its stainless steel parts. We give the NV series of trolling motors an A- rating. They are not as adjustable when it comes to mounting options on kayaks and we wish the hand tiller had some more flexibility in the hand tiller. Besides that, these are hardy little trolling motors that run reliably and offer good battery life. If you can get it set up in the right position, you will have a trolling motor on your kayak that can get in and around underwater structures and even handle the salt if that interests you. A purpose-built kayak trolling motor would seem to have a leg up in the competition, and the Kayak Series from Newport Vessels is the first of these offerings. This series of trolling motors from Newport are similar to the NV series but there are some subtle differences. Still, these small differences caught our eye and when compared to other trolling motors that can be used on kayaks, we couldn't leave these motors off this review. These trolling motors do mount to the transom and are controlled by a hand tiller that can extend up to 6”. There is not much to complain about when it comes to the sensitivity of the control. The five forward and three reverse speed control are easy to adjust by turning the hand tiller. Like the NV series, it is also compatible with saltwater use. These trolling motors come in a 36 and 55lb thrust option though we like the 36lb model for kayaks because of the size and the increase in runtime you are going to get from it with a 12V battery. This trolling motor does have a 5-point LED battery display on the control head which we always think is a useful feature. This model has a 24” adjustable shaft which we love for kayaks that are going to be used in shallow water. It is made from a composite fiberglass material that has some flex but not too much bend in it which makes it pretty useful trolling shallow waters where there is going to be some undergrowth. It also features a large three blade prop that can handle some vegetation without getting choked down. 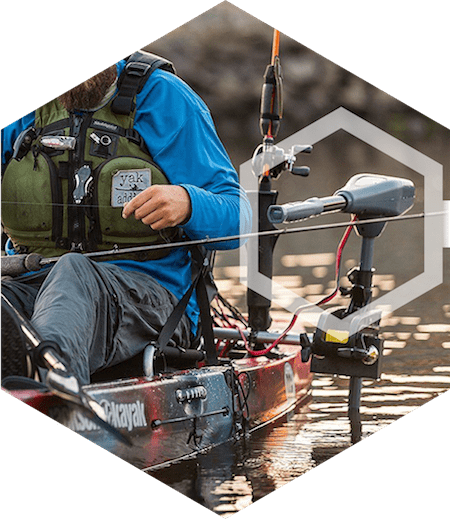 We also like that this trolling motor has extended cabling (5 ½ feet) that helps you place the battery in the most optimal and safe position for your kayak. There is a lot to like about this trolling motor. 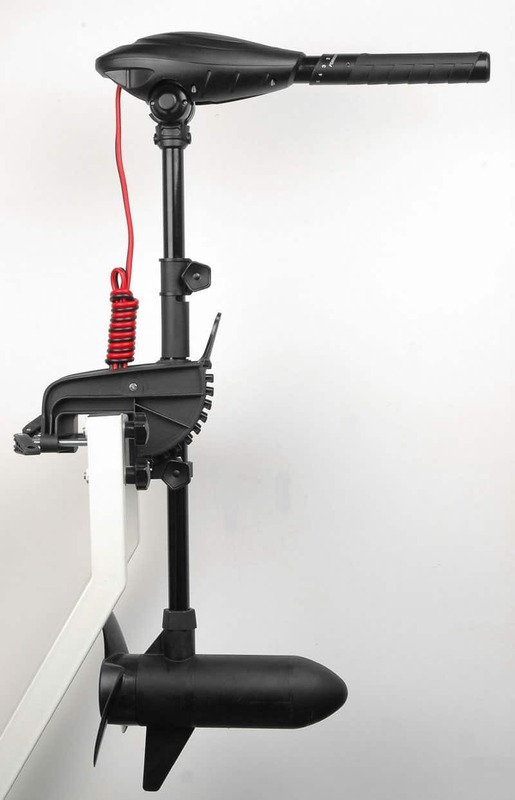 It is very similar to the NV series of trolling motors in its design, but the small details make it suited for kayak use and bumps our score to an A rating. The smaller shaft and extended cables make it more manageable for rigging up on a kayak and we love the 3-blade prop for shallow water and dense vegetation. The R3 series of freshwater and saltwater trolling motors from Motorguide is another transom mounting, hand tiller operation. The best feature of this trolling motor is the sheer amount of model options that are available. With the number of options you have, there are eight different models you can outfit to your boat for use in freshwater, and a further three for saltwater. For the models that make sense as kayak trolling motors, the thrust options are 30 and 45lbs of thrust. The shaft lengths on the kayak-recommended models are 18 and 30 inches so if you’re using the motor for a lot of shallow water use with your kayak, you need to be aware of the shaft length. All models do have a one-touch depth slide adjuster which is easy to use and it locks the shaft in place tightly. These models also differ in speed control. All thrust options except the freshwater 30lb thrust model have the option for digital variable or a five forward/two reverse speed control. We like the digital variable as it helps conserve battery life but the price does differ between the two options. All models can be run on a single 12V deep cycling battery which again, is nice for personal watercraft. The manufacture will provide you with the amperage that is drawn and you can easily calculate how much run time you can get out of the higher thrust options. These trolling motors are built extremely well. All use an aluminum alloy and stainless steel parts including in the lower unit with a powder coat finish that resists scratching and other types of damage encountered when using a trolling motor heavily. The mount on these trolling motors has a seven-point adjustment option giving you some flexibility in how the motor is position. It is also taper-locked giving the entire motor a very firm and secure base on a wide array of mounting designs. Overall, we give the Motorguide R3 Freshwater Trolling Motor an A- rating. We wish the smaller 30lb thrust model had some of the features of the larger model as most would like this size on their kayak or small personal pontoon. Besides that, this is a fantastic motor and if you are careful matching up the size of the motor with your boat, you might find your favorite kayak trolling motor in the R3 series. The Saturn 55lb thrust transom trolling motor is a hidden gem when it comes to a trolling motor for your kayak. You don’t find as much out there on it as you do other major brands of trolling motors but we think it has some characteristics that make it an excellent choice. This trolling motor requires a 12V battery which is nice to keep weight down on the kayak and it takes up less space. The drawback is making sure you conserve power as the trolling motor pulls 50amps an hour. It does have a battery level display making it easier to monitor. 55lbs of thrust on a kayak might seem a bit much for some people, but for a direct transom mount being used as a primary motor source, the 55lb thrust, and the other features we will get to make it a great option. This is a transom mount and some reviews from the larger retail sites show that the mount can be a little shaky at times. Even so, there are other aspects of this trolling motor that make it stand out from other models we have looked at so far. The tiller handle on this trolling motor is very flexible in its adjustments. It can be adjusted at the angle of the tilt and it can be extended up to 13.5 inches. As far as running reliably, the Saturn 55lb motor has very positive reviews. It might not have the following as other trolling motors from bigger brands but if you want a reliable motor that doesn’t require as much of a financial decision, the Saturn might be an option to look into. This trolling motor has a 26inch composite shaft making it a good size for kayaks trolling shallow water. The motor has eight different set speeds with five forward and three reverse settings. Overall, we give this trolling motor a B+ rating. We like the simplicity of the motor and it’s a great option for a primary motor on a kayak or small watercraft with 55lbs of thrust. 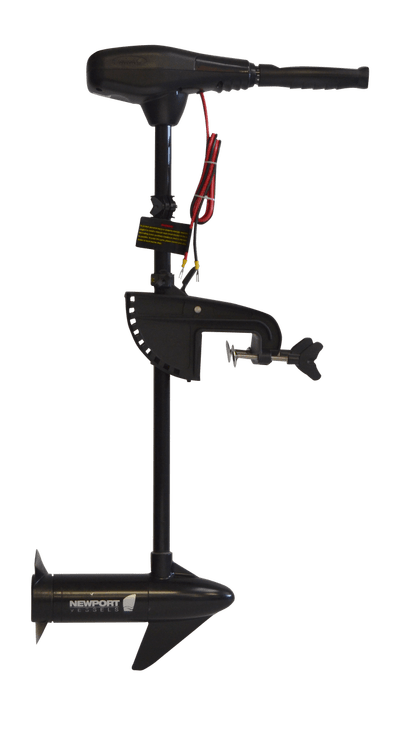 It falls below the A rating because of the issues with a shaky mounting in rough waters and it is a little jumpier than other trolling motors. Neither are usually issues for the average kayak trolling motor. Before we let you go, we like to take the trolling motors we have examined and give out some additional accolades. We are confident in all of these trolling motors and would not hesitate to mount them on our boats but there a couple that caught our eye. We hope that this article has opened up some new options regarding choices of kayak trolling motor and shed some more light on components that make up a motor suitable for kayak and other small vessel use. For the average kayak trolling motor, you don’t see a lot of the high tech software you will find with larger motors. 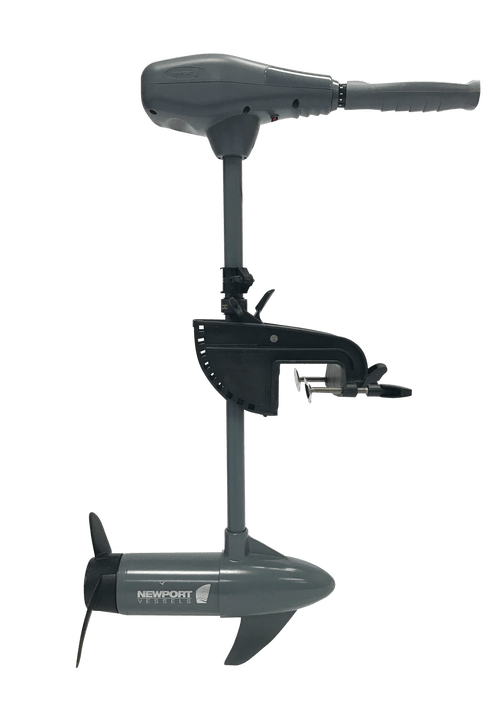 Technology encompasses more than just software and electronics though and we think the Newport Kayak Series of trolling motors is extremely innovative. With the shortened shaft and extended battery cabling, this trolling motor was designed with kayaks in mind. We especially like the 3-blade propeller which you don’t usually see on smaller trolling motors but is perfect for kayaks moving through shallow water.